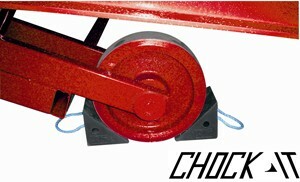 Wheel Chocks: Wheel Chocks are required when operating Mobile Yardramps. 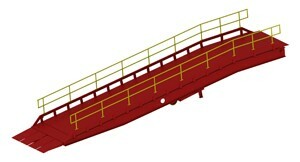 A minimum of two ramp chocks and two vehicle chocks are recommended. 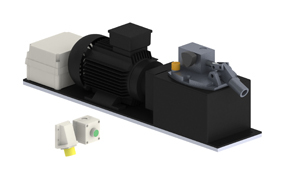 Electrical Pump Upgrade: An alternative to the standard hydraulic hand pump is the option of an electrical pump, this can be used to raise and lower the ramp with the press of a button. The electrical pump is available in three types, 110V, 240V, and 415V 3-Phase depending on the power available on site. An accumulator system is also available, which reduces the risk of damaging the seals in the hydraulic cylinders when the ramp is towed, whilst travelling over rough ground. 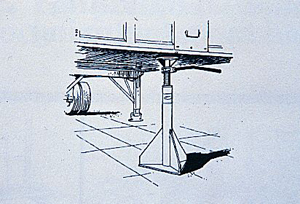 Trailer Safety Supports: Trailer Safety Supports are designed to provide additional support under the fifth wheel of a parked trailer with no cab in situ. They prevent trailers tipping when unbalanced during (un)loading. Three-Wheeled FLT’s: All our Yard Ramps are designed, tested and approved using four wheeled trucks. It is important that we advise that if three wheeled trucks are to be used this puts 50% extra point loading onto flooring and as a result additional flooring supports will be required to prevent damage. 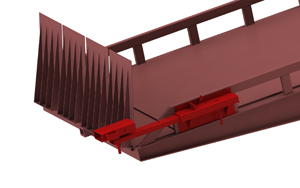 External FLT Towing Adaptor: Folding Entry Type ramps are towed behind your FLT. 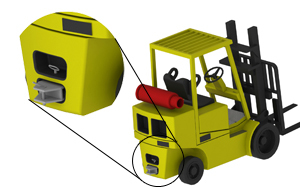 When turning tightly, ‘internal’ towing pockets on FLT’s can cause the ramps to bind – external pockets are therefore required to prevent damage and improve usability. If your FLT has an internal towing pocket, we can provide an adaptor to suit. Telescopic Towing Adaptor: This adaptor can be retro fitted to Folding Entry Type ramps. This allows the ramp to be moved in a similar way to Integrated Entry Type ramps, for one-man operation. Handrails: If operators need to walk on the ramp, to meet working at height regulations we strongly recommend full length handrails to both sides. Anti-slip Grit flooring may be also be required to the entry and exit sections of the ramp.